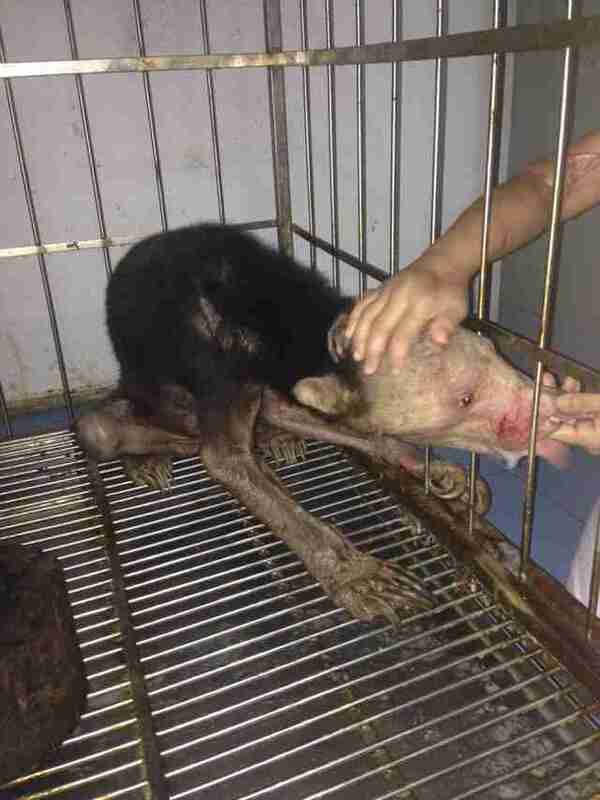 The heartbreaking story of a young sun bear kept in a dark room for most of her short life is a searing example of the unthinkable suffering people inflict upon animals captured for the wildlife trade. WARNING: Disturbing and graphic images below. Volunteers from the Wildlife Friends Foundation Thailand arrived at a Buddhist temple last week to do a routine check-up of their animals. 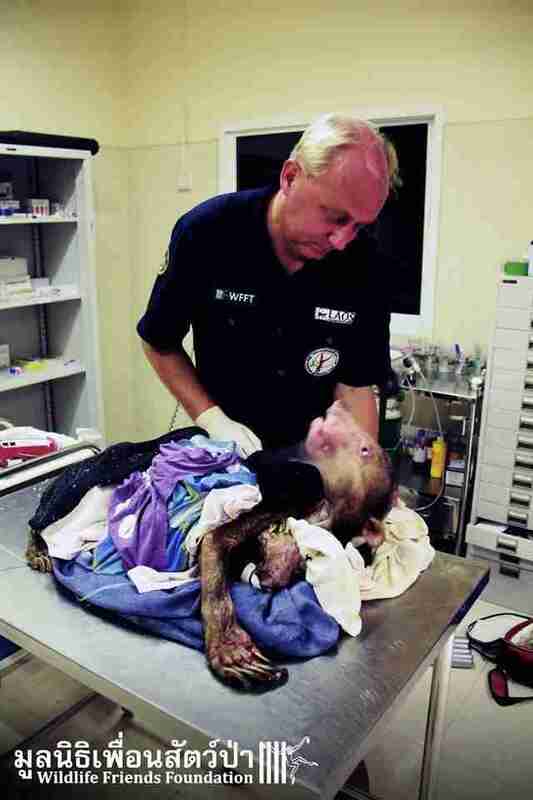 They discovered something horrible: a 3-year-old sun bear named Kwan who had been kept in a dark, sunless room for the past 2 years. Pictures of Kwan are absolutely wrenching. 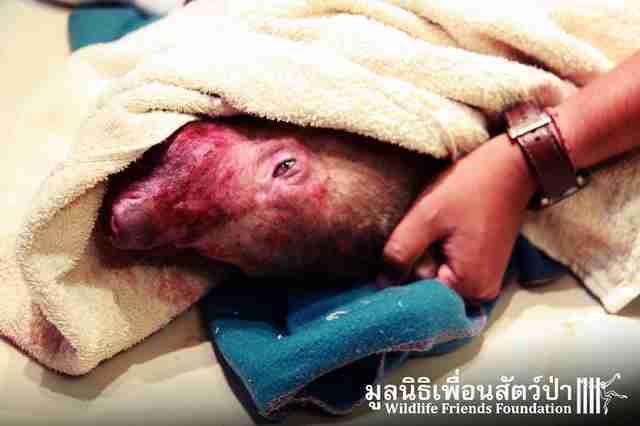 Emaciated and hairless, it's impossible to recognize the shrunken figure as a bear. Her face is covered in sores, and she has twisted, untrimmed claws. 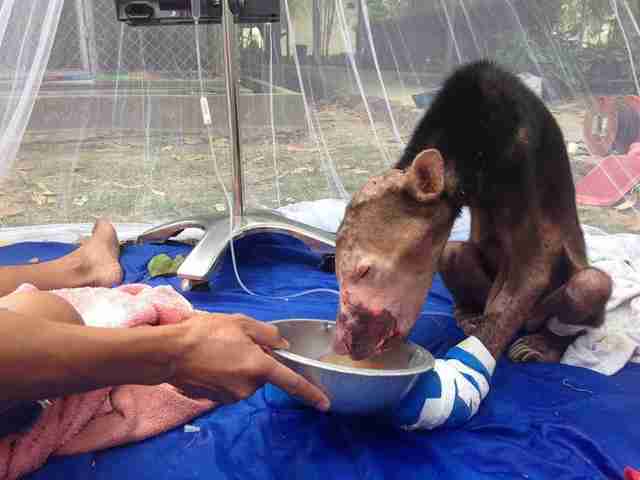 She can barely hold up her head, but she still turns to her rescuer in what looks like a show of gratitude. For comparison, this is what a healthy sun bear looks like. The group "begged" the temple to let them take Kwan, they said in a post, and rushed her to their rescue center. 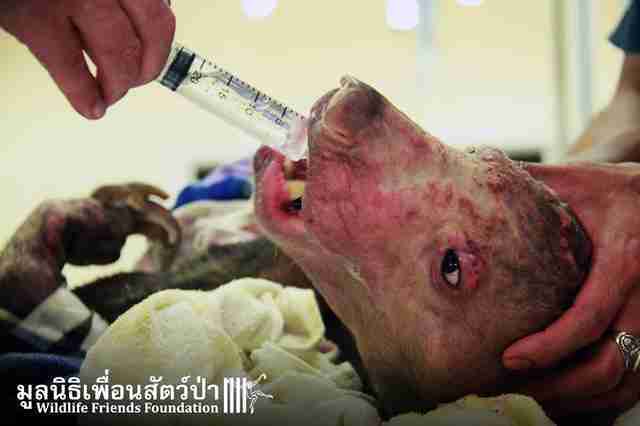 They fought through the night to keep her alive, though she was too weak to eat and stopped breathing several times. Despite their best efforts, the little bear slipped away a few hours later. 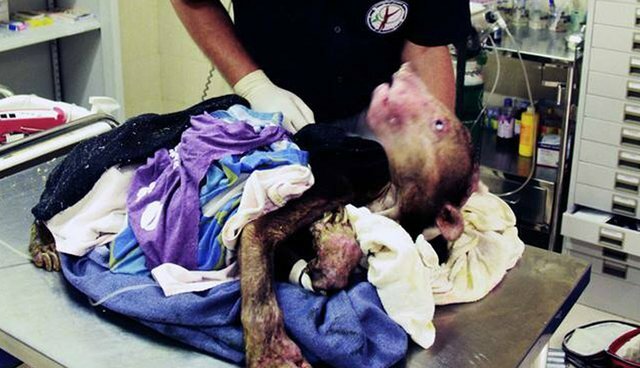 "We have done all we could to keep her with us," WFFT wrote. "We are all devastated of this loss." While Kwan was worse off than most, she's not alone. In Thailand, where the exotic pet trade is still thriving, many people take in young wild animals only to become disenchanted when they grow up. The easy thing to do is dump them at a Buddhist temple, which are seemingly "sacred places" where animals should be protected, WFFT said on Facebook. But many of the animals abandoned at these temples are doomed to lives of neglect in small, barren cages. Many monks are well-meaning but unprepared to care for wildlife, and a few shameless temples will encourage people to turn over their animals so they can create zoos of sorts. These zoos, like the one where Kwan was kept, bring the temples both attention and money. 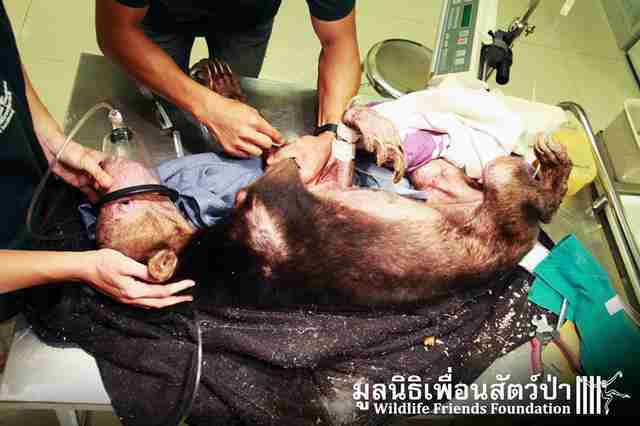 "When you have six bears, three gibbons, five monkeys, then it's not a coincidence anymore," WFFT founder Edwin Wiek told the Los Angeles Daily News. "It's a business." 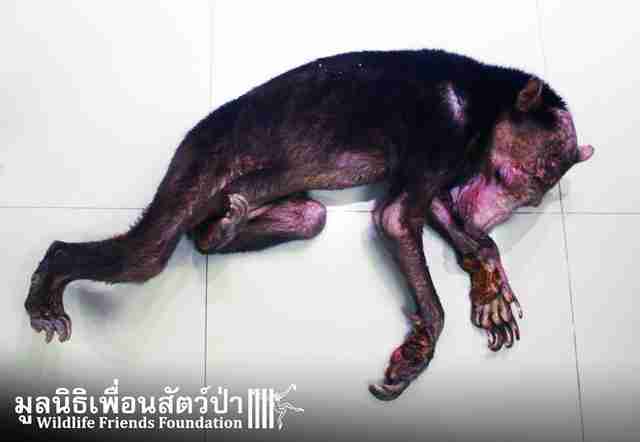 While WFFT is working hard to fight this practice, they have no power to seize animals and it's difficult to get authorities involved when the culprits are monks. "Religious leaders are just like politicians and wealthy people often above the law, so legal charges for illegal wildlife possession or animal cruelty are usually not pressed by police or other authorities," the group wrote. There are still four other bears at the temple where Kwan was found, kept in dirty cages with rotten food, but they might have a better chance than she had. WFFT has been complaining to authorities about the temple since 2012, though they only discovered Kwan the day they rescued her. After her story was posted, authorities told the organization that they would be removing the other four bears within the next few days. Kwan's story is an extreme example, but every year the illegal animal trade takes tens of thousands of lives. Many wild mothers, including bears and orangutans, are killed so their babies can be sold into captivity, and those babies often end up with unprepared owners who abuse or abandon them. The illegal wildlife trade is a lucrative and dangerous criminal business, and the problem isn't restricted to overseas - there are 5,000 tigers in captivity in the U.S. alone, more than there are left in the wild in the entire world, and only 6 percent of those are in accredited zoos. 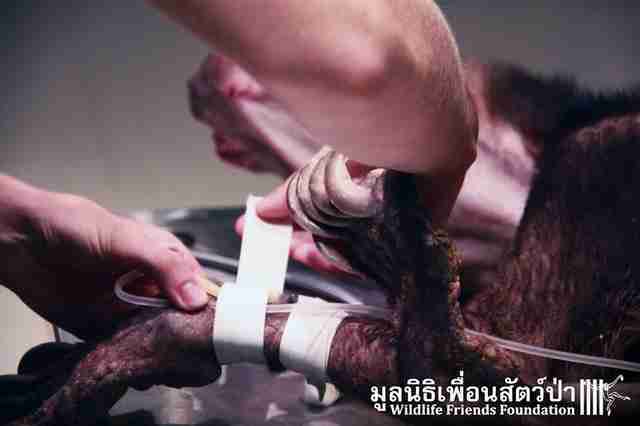 WFFT is working hard to save the lives of the other temple bears. If you'd like to support their efforts, you can make a donation here.